Synthetic peptide within Human ZNF256 aa 200-300 (Cysteine residue). The exact sequence is proprietary. K562, HeLa and MCF7 cell lysates, HeLa cells. Our Abpromise guarantee covers the use of ab170906 in the following tested applications. WB 1/1000 - 1/10000. Predicted molecular weight: 72 kDa. Transcriptional repressor that plays a role in cell proliferation. Requires TRIM28 for its activity. 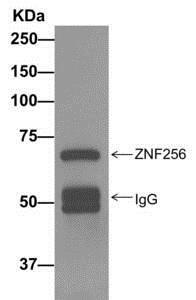 Contains 15 C2H2-type zinc fingers. The KRAB domain mediates interaction with TRIM28 and is required for transcriptional repressor activity. 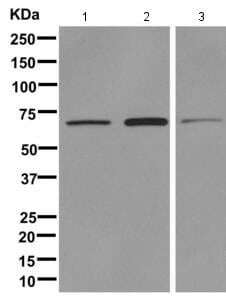 Western blot analysis on immunoprecipitation pellet from HeLa cell lysate labeling ZNF256, using ab170906 at 1/10 dilution. 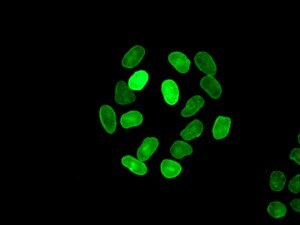 Immunofluorescence analysis of HeLa cells, labeling ZNF256 using ab170906 at a 1/50 dilution. ab170906 has not yet been referenced specifically in any publications. Publishing research using ab170906? Please let us know so that we can cite the reference in this datasheet. There are currently no Customer reviews or Questions for ab170906.